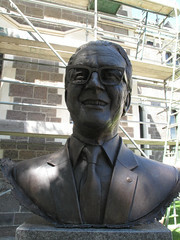 Sir Robertson Stewart is one of the Canterbury Heroes - a set of twelve bronze busts of important local figures. Born 21 September 1913, died 13 August 2007. From humble beginnings in suburban Christchurch, Sir Robertson Stewart became one of New Zealand’s foremost industrialists and exporters. His father, Robert McGregor Stewart (d. 1956), was an accountant who served in World War 1. His parents separated when Stewart was six years old. He remained in Christchurch with his mother Ivy and younger brother Max. Stewart details his early life in Sydenham and Linwood, his schooling at Christchurch West (later Hagley High School) and Christchurch Boys’ High School in his autobiography From Tin Shed to Knighthood. Stewart recuperated at the Bottle Lake Hospital in Burwood after a scarlet fever outbreak in 1928. He never went back to school, but became an electrician’s apprentice with H. C. Urlwin Ltd (based initially in Woodham Road, and later in Manchester Street). His starting wage was 15 shillings a week. Stewart credited Urlwin with two cornerstone attitudes in his life: Never give up; always say you can do it; and never be frightened of anyone or anything . 1. Stewart was awarded his electrician’s examinations after three years as an apprentice, but had to wait until he was 19 to be registered. Urlwin sent Stewart to England in 1935 to study plastics and a newly-developed moulding powder. On his return home in 1936, a plastic moulding press was installed and soon after a factory was built in Waltham Road. During the Second World War Stewart worked on producing many plastic moulded pieces for aircraft and other items for the war effort. He served in the Home Guard, reaching the rank of sergeant. In 1947 Stewart started his own plastics company, which failed, and he eventually took a position with Plastics and Diecasting Ltd, owned by Harry Vale.2. Vale offered the company to Stewart in 1957 for £195,000, and Stewart took ownership in November of that year, renaming the company PDL Industries Ltd. PDL became a leading exporter of electrical equipment from its Christchurch head office, making plastic and electrical components that can be found in most New Zealand homes. Offshore trade missions started in the 1960s, firstly to the Pacific Islands including Tonga, Samoa, Tahiti then later South East Asia. Trade missions continued throughout the 1970s, focusing on the exporting of New Zealand goods. PDL became a public company in 1973.3. Between 1947 and 1988 PDL rapidly expanded, and it bought, amalgamated, or otherwise took over 28 companies. A Malaysian factory was opened on 1 November 1967 to make plugs, sockets, circuit breakers and other accessories.4. Another successful venture was Torro Toys, a plastic-block based construction and building system. It was based in Westport. The PDL factory moved into the Zealandia flour mill on Hazeldean Road in 1981, and the company survived tough times in the 1980s but remained profitable. It was sold to French firm Schneider Electric in 2001 for $97 million dollars. Stewart married Gladys Gunter in 1937. Their first child, Robert, was born in 1940, followed by Elizabeth (Lee) in 1943 and Peter in 1945. This first marriage was later dissolved, and in 1970 Stewart married Ellen Adrienne Cansdale, nee Peake. Two children were born of that union, Mark James and Todd Huntly. Stewart owned Coldstream Lodge in Fendalton from 1970 to 1989. He then moved to an apartment in Heatherlea. At the time of Stewart’s death, he and his wife were dividing their time in Christchurch between properties at 127 Scarborough Road in Scarborough and 52 Wroxton Terrace in Fendalton.5. Robertson Stewart’s life-long passion for vehicles began with a Douglas EW motorcycle, and races at the Monica Park dirt track in Ferry Road and the Aranui Speedway. An AJS motorcycle was another early machine he owned, along with a Norton that reached 100mph on New Brighton beach.6. In 1935 in England, Stewart owned a Singer Daytona hand-built; there were only five ever made and the car was later shipped back to New Zealand. In 1960 Stewart purchased an Aston Martin DB4, and reached a speed of 142.5mph on Tram Road in a flying kilometre trial. Stewart also owned a Gordon Keeble (No. 94 of 96), a 265 GTB 4 cam Ferrari, and a 365 GTB 4 Ferrari Daytona. PDL Motors Ltd was formed in 1968, initially racing Minis and then progressing to V8 cars. The team raced a Falcon for two seasons, and then bought a Mustang. Mustang Two was built from scratch. Its six-litre engine powered it to numerous lap records around the country. It remains one of the fastest and most successful vehicles in New Zealand’s motor racing history.7. PDL also sponsored the PDL jet boat. 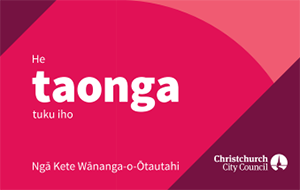 Stewart was a Christchurch City Councillor from 1969 to 1972, a Southern Ballet Trust Council member, honorary consul to Malaysia (1975), and a life member of the Canterbury Manufacturing Association. In 1970 he received a CBE and in 1979 a knighthood. He donated the Stewart Family Bells to ChristChurch Cathedral, which were tolled during his funeral.